The MEL data logger is designed to collect precise time stamped data for extended periods. It is available with a 3-axis 16g accelerometer logger (MEL-x16), a 3-axis 2g accelerometer (MEL-x2), or a high precision barometric pressure logger (MEL-b). 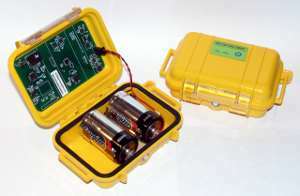 The electronics are packaged in a watertight enclosure with a pressure equalization port. Two D-cell batteries power the system for 60 days continuously and data is save to a 8GB microSD memory card. Data files are accessible via USB connectivity or by removing and accessing the microSD card directly (card reader not included). Reference the MEL user manual for detailed capabilities and operating procedures. A simple text file is used to configure the device settings, which can be modified using a simple text editor. Data is contained in easily readable plain text files in the same format as the repective X16-1D, X2-2, or B1100-2 data loggers. The comma delimited data (.csv) can be analyzed with a spreadsheet or text processor. An example data file is available here.